An update was forwarded to us by the Mt. Guiting-Guiting National Park in March 12, 2013. Please check it out here: Mountain News: New policies and updates from Mt. Guiting-Guiting. One of the most difficult climbs in the Philippines is a hike to Mt. Guiting-Guiting, in Sibuyan Island, Romblon. In the difficulty scale used by PinoyMountaineer.com, it stands with Mt. Halcon and Mt. Mantalingajan as the upper limit. 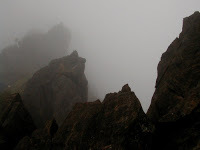 This is because of the steep, jagged ridge called “Knife Edge” which one has the cross in order to reach the summit, not to mention the ensuing rock formations with colorful names such as “Kiss the Wall”. On top of this precarious trail, the weather is so volatile that mountaineers would use absolute cut-off times (i.e. 1300H) to reach the summit, otherwise they would have to turn back. By implication, only mountaineers with enough stamina are advised to attempt the G2 climb. The possibility of failure is always there: if the local guides perceive a dangerous weather change forthcoming, the assault is aborted. Patience and perseverence – virtues of a true mountaineer – are put to the test in Mt. Guiting-Guiting. Mt. 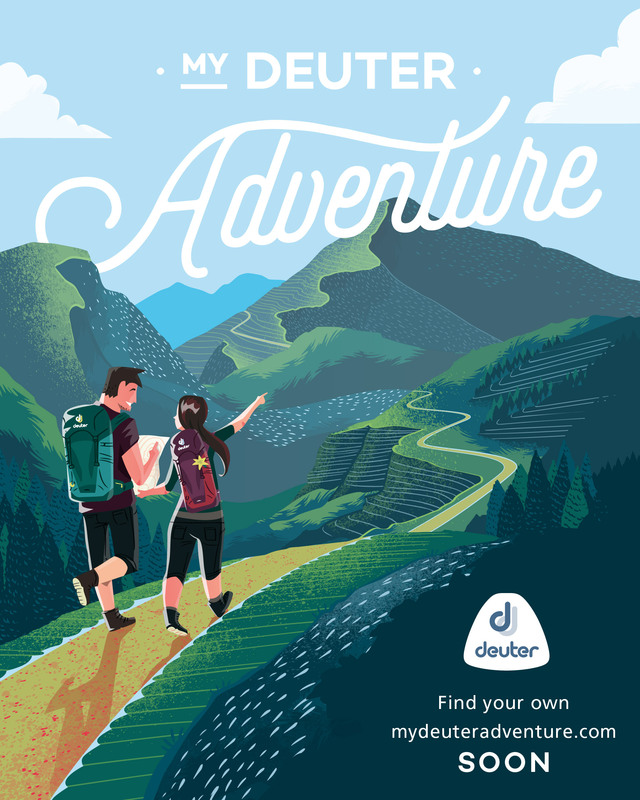 Guiting-Guiting – fondly called G2 by enthusiasts – was discovered as a mountaineering hotspot during the early 1980’s – an exciting period for Philippine mountaineering, when the novel sport has just begun unravelling new and exciting destinations. In May 1982, a combined team of the Philippine Mountaineering Society (PMS) of Bacolod City and UP Mountaineers did the first exploration of the mountain, reaching the then-unnamed Mayo’s Peak but failing to reach the summit. A few weeks later, some of them returned to make the first ascent to G2’s summit. They were Mon Ruiz, Kim Valino, Bubot Tan Torre (UP Mountaineers) and Edwin Gatia of the PMS. Even without the accomplishment of getting to the summit, however, a visit to G2 is rewarding enough. To begin with, Sibuyan island is a jewel of the seas. 187 nautical miles from Manila, the 445-sq.km island has beaches, waterfalls, and one of the cleanest rivers in the Philippines. Mt. Guiting-Guiting is the culmination of this sanctuary, possessing what has been called the most diverse forest in the world, being the habitat of up to 54 endemic plant varieties. Moreover, Mt. Guiting-Guiting is home to fascinating endemic flora and fauna. These include four species of rodents and a kind of bat discovered only in the mid-1990s and found nowhere else in the world. 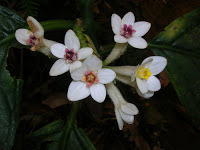 On the trek, hikers can attest to this natural richness with the presence of beautiful flowers, such as the one shown on the photo. Meanwhile, the locals of Sibuyan have lots of folk beliefs about the mountain. It is said that there is a hidden village of spirit beings that dwell in the mountain; they can take the form of humans and even pilot ships that they take into the mountain via an invisible connection to the sea. 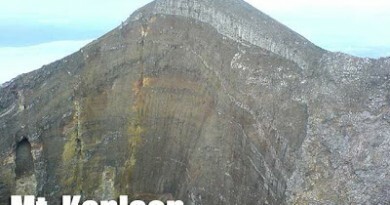 To support this, they speak of a “Tinagong Dagat” (Hidden Sea) in the mountain. Other locals warn would-be hikers to ask permission before picking fruits or taking treasures. A large diamond was said to have been discovered in a waterfall, only to turn into dust when it was taken out of the island. Unusual flora are believed to be manifestations of the “engkanto” — if you pick them, you risk their wrath. On the other hand, good virtues are also attributed to the ‘engkantos’. When a Japanese ship tried to land in Sibuyan Island, it is said that clouds enveloped the entire island, hiding them from the foreign invaders. Sometimes, however, the spirit people can fall in love with mountaineers. These cultural beliefs, although in their twilight, add flavor to the G2 experience. But more than the natural and cultural dimensions, it is the technical nature of the climb that attracts mountaineers. THE TRAIL Click on the map to enlarge and view the trail of G2’s summit assault. The climb proper takes three days. 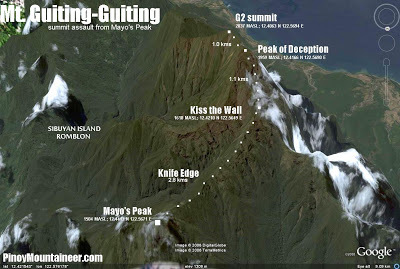 Day 1 is the hike up to Mayo’s Peak (1550 MASL). Three streams, all very clean, will be crossed before reaching Camp 1, and three camps will be passed (marked as Camp 1-3) before reaching Mayo’s Peak. The trails are in very good condition and is surrounded by woodlands throughout. Since Day 1 may be delayed by transportation problems, it may be deferred to the next day after arrival at Sibuyan Island. Or, the itinerary may be modified and Camp 3 can be the campsite on the first night, leaving the last leg of Day 1 to early Day 2. Just before Mayo’s Peak. Normally, Day 2 is the 4-5 hr. assault to the summit, and back. It is perhaps one of the most intense day in any itinerary in this website. A swift descent from Mayo’s Peak will lead to the “Knife Edge” – here the entire trail is rocky and exposed to the sun and winds; there are ravines on both sides: the view is both breathtaking and scary! Beyond this ridge are even more precarious rock formations: each is like a puzzle that must be solved, and climbers will try what body position and movements will best suit each hurdle. Some of the rocks you will step on are just a few inches wide; but with the sharp edges of the rocks make for nice hand supports. If you still have time you can take pictures of the delightful flora that grow on the rocks (including the endemic pitcher plant), as well as the stunted trees that coil on the rocks. After 3-4 hours, the Peak of Deception, an imposing sight, will be reached. They say this peak was also called “Peak of Decision” because from here you will have to decide whether to proceed or not, considering the time and one’s energy. From the Peak of Deception, it’s only 30-45 minutes away from the summit itself. The trails are still rocky and unforgiving. As a finalé, a wall called “Hillary Pass” must be negotiated: there is a 90-degree part here which is said to be impassable when slippery. After accomplishing this finale hurdle, the summit is only a hundred meters away and the trail, called “Walk of Fame”, is easy, a stark departure from the rest of the trail. 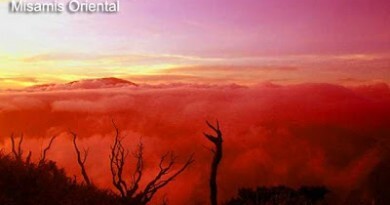 At the summit, when it is clear, you can see the neighboring peaks of the Guiting-Guiting range, as well as the seas surrounding Sibuyan Island. Again, there is a variety of unique flora in the summit. The ascent to G2 is just half of the adventure; the descent, it is said, is equally challenging. By 1300H climbers must turn back and head for Mayo’s Peak where one can celebrate and see the sunset (on the left side relative to the jump-off). You or your guides can refill water at Bulod’s Spring; and spend the rest of the night having ‘socials’. The third and final day is the descent back to Magdiwang. This may be done in a relaxed fashion: take time to appreciate the fauna and flora of the G2 forests. Large brown ants, birds, scorpions, and other fauna litter the trail. A refreshing dip in one of the clear streams after Camp 1 is a very rewarding treat after the arduous trek. After logging out at the DENR station, you can proceed to the beaches at Magdiwang (i.e. Bagumbayan). As you leave Sibuyan Island by ferry, the towering presence of Guiting-Guiting — and its saw-toothed peaks — will remind you of the unforgettable adventure that is G2! 0730 Start trek. Brace for exposed area. 1500 Arrival at Mayo’s Peak (1550 MASL). Rest. NOTE: An update was forwarded to us by the Mt. Guiting-Guiting National Park in March 12, 2013. Please check it out here: Mountain News: New policies and updates from Mt. Guiting-Guiting. Scheduling. The G2 climbing season is from March-mid May, although it is still possible to visit G2 throughout the year. However, by June, the rainy season sets in and the wind changes direction, making passage across the Knife Edge and beyond very precarious. Chances of summitting are thus very limited. The only disadvantage is that during peak season (Holy Week and surrounding weeks) the campsite may be crowded. After all Mayo’s Peak is not a very large campsite. As of March 2013, the Mt. Guiting-Guiting National Park has begun to implement limits to the number of hikers at a time; as per the carrying capacity assessment conducted by the DENR-ERDS and the Guide Association recommendation, 128 persons are allowed to camp the campsites in Mayo’s Peak, 18 at the summit, and 18 at Traverse Camp 3. Getting there. Transportation is a high logistical concern, and you will have to have contingency plans. MBRS Lines leaves every Monday 5pm from Manila North Harbor; Super Ferry also runs a weekly service. The most regular is the daily departure from Batangas Pier c/o Montenegro Lines, leaving daily at 1700H (i.e. M/V Princess Anavelle). A trip that connects directly to Magdiwang Port, however, is assured only during Thursday. Another possibility is taking the Lucena port, where there is also a weekly service to Magdiwang. Guides and Registration. The official “hotline” of the Mt. Guiting-Guiting National Park is 09284901038 (as of 2013). You should call prior to your trip to get clearance for your hike. You can inquire about number of climbers on that day, as well as weather conditions. Registration fee is P300/person – this includes climb certificate and a Tagalog-language booklet. Guides and porters used to be given P350/day but as of 2013, guide fee is now 800/day for Filipinos and 1000/day for foreigners; porters are given P600/day. The ratio is 1 guide and 1 porter: 5 hikers for the regular trail and 1 guide and 1 porter: 3 hikers for the traverse. Facilities. Facilities in the Guiting-Guiting National Park include guesthouses which have restrooms/ shower rooms with running water and electricity; the fee is P500/room (good for 3 persons) or P200/person. The rivers before Camp 1 are very clean and you can take a refreshing dip there before heading back to the park. Cellphone signal is present in the Park Center but sporadic even in the high elevations. However, it is present in Mayo’s Peak. SMART is said to have the stronger signal. Campsites available include the Camps 1-3, although these are small. Health and safety. The dangers of G2 are well-known, and precautions must be done. Weather conditions of concern include strong winds, which may lead to hypothermia, and prolonged exposure to the sun which coupled with the difficulty of the summit assault may take its toll on climbers. Then there is a risk of slips and falls, made more real by the reported deaths of four mountaineers in 1985. Although in the past decade G2 has been accident-free, vigilance and compliance to the rules is strongly advocated. Gloves are recommended during the summit assault; sunblock must be worn and the choice of clothing must afford flexibility to the climber. In case utmost emergency, quickly contact the DENR-PASU. Technical notes. The special factor in G2 is the summit assault in which your guides will have to determine whether it is still advisable to proceed, given the weather conditions as well as the physical condition of the climbers. It is better to endorse your itinerary to the guide, and also let him know if any climber needs particular attention/support so he can also prepare accordingly. Mayo’s Peak is named after Mayo Monteza of the Philippine Mountaineering Society (PMS) who celebrated his birthday in May 1982 during the first attempt to climb G2. Meanwhile, Bulod’s Spring is named after the guide who accompanied the first expedition. Bulod’s son Jerson was one of the locals who guided the group which the blogger joined. These have been documented in PinoyMountaineer in MountainTalk #2. Further explorations include a trail by Everest mountaineer Romy Garduce who assaulted the summit from the NE side, and a failed attempt several years ago to cross the picturesque saw-toothed peaks on the way to Mayo’s Peak. G2 is part of the “Knife Edge Trilogy” – Halcon, Mantalingajan, and G2 – all in MIMAROPA (Region IV-B), all with a “Knife Edge”, and all classified as Difficulty 9/9. They can be considered as among the most difficult mountains in the Philippines. 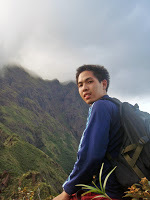 This article was written in Camp 3, at around 1300 MASL on April 22, 2008. The blogger thanks Sir Emman Palacio for taking him to yet another great destination (after last year’s Mt. Napulauan), and the rest of the team for a wonderful G2 adventure on March 20-25, 2008. Picture of the Knife Edge courtesy of Sir Richard Visco. My summit assault pic courtesy of Sir Jan Pambid. Thanks guys! 222 Comments on "Mt. Guiting-Guiting (2,058+)"
i hope this website blog is still active! pls! Pangarap ko na maakyat ang Mt. G2 noon pa man at iyon ay naisakatuparan ko nitong October 31 – November 1, 2013 kasama ang aking mga ka-grupo sa Metropolitan Mountaineering Society. Marahil ay hindi ko naihanda ng lubos ang aking sarili para dito dahil sa aking ibang aktibidad o marahil ay sadyang napakahirap talaga nitong akyatin o sadyang mabibilis lang ang aking mga kasama dahil sa loob ng 3 araw na assault ay nararating nila ang campsite ng mas maaga sa 2 o 3 oras liban sa akin. Nagpapasalamat pa din ako dahil delay man ako ng 1 oras sa itinerary ay may liwanag pa naman pag-abot ko sa campsite. Sa ika-2 araw ay panay ang buntung-hininga ko sa bawat paghalik ko sa batuhan magmula sa Peak of Deception at pagtapak sa matutulis na bato at madulas na tahakin patungo sa Mayo's Peak. Sa tulong ng porter at guide na si Toto, alam nya na aabutin ako ng gabi paglagpas ko sa knife-edged trail, kaya ako ay kanyang binalikan at itinawid hawak ang aking kamay at para bang nagkaroon ako ng pakpak na makatalon at makatawid sa walang katapusang malalaking tipak ng bato na ang nasa gilid ay pawang mga bangin. Sa ika-3 araw, pagbaba ay parang nawalan na ng lakas ang aking mga tuhod at kusa na itong tumitiklop kaya ako ay nag-baby-step na kasunod ko ang porter na si Elias, bago kami umabot sa kalagitnaan ay sinabi ko na alalayan na ang aking mga kamay para mapabilis ang lakad ko. Bago dumating sa camp 2 pababa ay binalikan kami ni Toto ay dinala na nya ang aking backpack at sya na ang umalalay sa bawat hakbang ko. Hindi ko mailarawan ang aking pasasalamat sa mga guide at porter ni Ka Remy. Sobrang magagalang sila at naramdaman ko ang bukas palad at buong puso na pagtulong nila. Napakahusay nila at bihasa sa kabundukan dahil nakatsinelas o naka-paa lang sila. Naitanong ko sa kanila na marahil ay tinatakbo lang nila ang Mt. G2 noong mga musmos pa sila. Marahil ay hindi ko na mababalikan ang kabundukan ng Guiting-guiting pero maaaring balikan ko ang kapatagan nito at muling magpasalamat sa mga porter ni Ka Remy lalung-lalo na kay Toto. Medyo nainggit lang ako sa mga kasama ko dahil nadatnan ko na naliligo na sila sa dagat pero natuwa sila ng makita ako. Si Ka Remy ay napakalaki ng ngiti at kinamayan ako at iniisip pala nya na baka abutin ako ng kadiliman katulad ng ibang mountaineers na may nakakababa daw ng alas-2 ng madaling-araw. Sa presentation ng Certificate of Achievement, ayon kay Ka Remy record breaker daw ang MMS sa male at female na nakaakyat doon. Dahil ang aming kasama na si Enrico ang oldest male at ako ang oldest female na nagawang mag-traverse from Olango Trail Exit via Tampayan Trail. Maraming salamat sa site ng Pinoy Mountaineers dahil dito ko binabasa at pinag-aaralan ang kabundukan bago ko ito akyatin at higit sa lahat, salamat sa Poong Maykapal dahil ipinakita nya sa amin ang kagandahan at magandang panahon sa Mt. Guiting-guiting bago dumating ang unos na si Yolanda makalipas ang 4 na araw. tnxs sa mga pumupunta here s sibuyan.. more power.. Note: There is a an additional route to the summit of the Mount Guiting Guiting. You need a bit more experience to reach the summit. But it is much more interesting then the route who is known on Magdiwang's side. Accommodation: Nearby – ask Tom he is your host onsite and is connected with the guides. Certified guides are available as well as some porters. How to reach Sibuyan (update): Take the ferry "Grand Unity" ( Navios Shipping Lines) from Batangas to Cajidiocan. In Romblon/Romblon you can stay on this ferry and your journey continuous to Cajidiocan/Sibuyan Island. Goodday! I would like to ask if there is any open climb for this mountain on this month of May? Im a freelance climber and having vacation from Dubai. Il be leaving June, and im really looking forward to climb this mountain. any suggestions would be a great help. thank you so much more power!